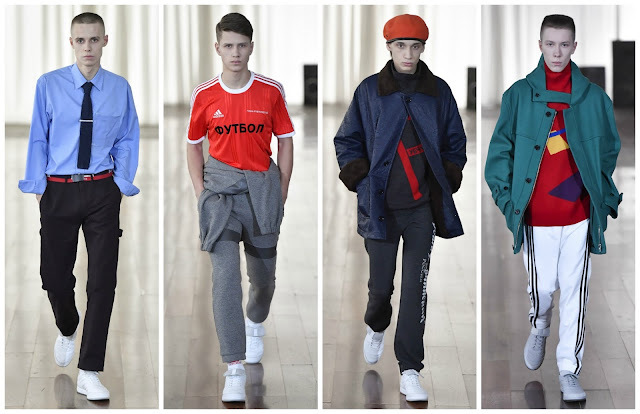 There hasn’t been a more prolific designer in the world of menswear in recent times than Gosha Rubchinskiy, an unassuming Russian man who promised less than ten years ago that everyone would know his name in a decade. He has amassed a cult like following of committed teenage boys who have redefined what it means to be an influencer. They have become intrinsic to the brand’s marketing campaign, with imagery saturated on social media feeds from these willing customers, who are prepared to fork out the price tag for a t-shirt, a sweatshirt, tracksuit bottoms or a jacket. The fashion press similarly have latched onto the Gosha train and cover extensively his presentations, collaborations and projects, of which there are plenty. The Fall 2017 show was the induction to a new collaboration with Adidas, the sportswear giant. Over three seasons, Adidas will sponsor Rubchinskiy. The collaboration comes with menswear presentations in Russia, where the 2018 Fifa World Cup is scheduled to be held. The first partnership saw editors transported, courtesy of Adidas, to Kaliningrad. Kaliningrad was formerly a German city, damaged heavily during World War II. Rubchinskiy emphatically professes his love of country. To him, Russia is a great place. He also expressed his disinterest in presenting something political, but simply showing in Russia, especially in January 2017—when news of the US election hacking scandal was prominent—could be interpreted in other ways. There were football jerseys and finely cut tracksuit bottoms. (If there’s one thing Rubchinskiy’s stylist knows what to do, it’s convince the viewer of the boy’s presumed milieu.) A smattering of windbreakers and bottoms ensued, and there was some delectable knitwear in the mix. It was a collection replete with basics, but somehow they were associable with his sportswear, youth-centric aesthetic. However, some of the clothes took a more mature route. There were suits and ties, recognisably Russian motifs. They were daring for Rubchinskiy, whose meat and potatoes are t-shirts and tracksuits. Perhaps they could be considered an experiment: will a teenage boy be interested in a checkered double-breasted blazer or a dull, military uniform-inspired shirt? The aforementioned order of teenage boys, the ones that have transformed Rubchinskiy’s business into a multimillion euro operation—recently, at the expense of my bank account, I became one of those acolytes. I purchased a t-shirt, printed simply with ‘Europa?’ in Cyrillic script; it’s a simplistic design and the quality of fabric is superior to that of ‘just another t-shirt’; moreover, it’s symbolic of our political history. His brand is worth the hype and the price tag.